This is the awesome sight presented to the walker descending the first Crinkle: there's a vertiginous drop on the right into Great Cove, and the enormous chockstone in the gully appears to block all progress. 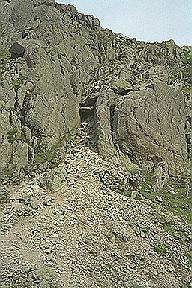 The path comes into frame on the left and the chockstone is avoided via the Bad Step. Larger version of this picture.